Imagine relaxing in a cove, listening to the sounds of water rippling. Then, you feel a firm tug on your fishing line. It"s going to be a big one! Picture the surface of the lake glistening, water spraying your face, the boat motor ahead roaring. Suddenly, your skis give way to a splash landing! Hear the laughter of children, smell charcoal drifting through the air, feel a breeze blowing through the campground. With almost 14,000 acres of water, all this and more is yours to discover at Jordan Lake. The NC Division of Parks and Recreation operates eight recreation areas on the lake: Crosswinds Campground, Ebenezer Church, Parkers Creek, Poplar Point, Seaforth, Vista Point, Robeson Creek and New Hope Overlook. Whether you"re looking for fun in the sun or an evening under the stars, Jordan Lake offers it all. Contact the park office for reservations. Entrance fees are charged in each recreation area managed by the NC Division of Parks and Recreation to supplement operational costs and help maintain and improve the areas for visitors. The fee is $5 per car, $3 for senior citizens ages 62 and older, and $10 per bus. Entrance fees cover only recreation activities. Separate fees are charged for picnic shelter reservations and campsites. Accessible activities Persons with disabilities will find access to a wide range of recreational facilities, including accessible picnic shelters, trails, swim beaches and campsites. Most parking lots have special spaces available, and the restrooms are accessible as well. Accessible camping and swimming are available at Parkers Creek and Poplar Point. Vista Point offers one accessible campsite, as well. Park staff will guide you to facilities best suited to your needs. Bald eagle watching See if you can spot our nation"s bird from either the NC 751 bridge crossing Northeast Creek or the NC Wildlife Resources Commission"s Wildlife Observation Deck. The observation deck is located five miles south of I-40 on NC 751, 6.5 miles north of US 64. Click on one of the options below to listen to the call of a bald eagle. Boating Each recreation area has boat-launching ramps providing easy entry to the water. Boat ramps open 24 hours per day are located at Ebenezer Church and Robeson Creek recreation areas. All other boat ramps are open during park hours, and visitors must exit the park before the park"s closing time. Boating facilities open during park hours include six boat ramps and three docks at New Hope Overlook. Seaforth offers six boat ramps, and Vista Point offers four boat ramps. Crosswinds Campground offers two boat ramps for campers only, and Poplar Point offers four boat ramps for campers only. Be cautious of underwater hazards such as stumps, logs and rocks. The Uniform Waterway Marker System has been installed for your safety and convenience. Obey all buoys and markers. Test your sailing skills on Jordan Lake. The most popular area for sailing is Vista Point while windsurfers enjoy Ebenezer Church. Wind speed information can be obtained by dialing (919) 387-5969. Camping Pitch your tent or park your recreational vehicle at one of more than 1,000 family campsites. Crosswinds Campground offers campsites for both recreational vehicles and tents; 129 sites have water and electric hookups at the site. All sites include picnic tables, grills and trash containers. Showers, restrooms and a dump station are centrally located. Parkers Creek offers 250 sites for RV and tent camping. Of the sites, 150 have water and electric hookups. Each site contains a picnic table, grill and lantern holder. Showers, trash containers and restrooms are located nearby. Poplar Point offers 580 sites for spending an evening under the stars, and 361 sites have electric hookups. The sites include picnic tables, grills and trash containers. Showers and restrooms are located nearby. Sites for recreational vehicle use only are located at Vista Point, and New Hope Overlook offers primitive hike-in campsites. Campsites are available on a first-come basis for a fee. Reservations can be made for a stay of seven days or longer at least two weeks in advance. The maximum stay in any campsite is two weeks. Backpack and canoe camping: For those who prefer a more primitive campsite, New Hope Overlook offers 24 campsites nestled in the woods. These sites range from 100 yards to a half mile from the parking lot. Or, reach your campsite by water; canoe to the area from a nearby boat ramp. Each site has a picnic table, grill and lantern post. Mulch toilets and drinking water are provided nearby. Group camping: Two areas offer sections for camping clubs and other groups. Parkers Creek has six campsites available for group camping. Drinking water and restrooms are provided. Vista Point also offers five group campsites with drinking water and restrooms nearby. Contact the park office for reservations. Vista Point offers five campsites for group RV camping. All sites contain water and electric hookups. Although these sites are open year round, water to the sites is turned off in the winter. Campground hosts: Volunteer campground hosts work with park staff to provide information and assistance to campers. To volunteer, pick up an application at the park office. Education and events Rangers hold regularly scheduled educational and interpretive programs about Jordan Lake State Recreation Area. Click here to search our database of park events that are free and open to the public. Rangers also hold special programs for groups and classes. To arrange an exploration of Jordan Lake State Recreation Area for your group or class, group leaders must complete a program application and submit it to the park at least two weeks in advance. Contact the park for further information. Fishing is a popular sport on the lake. Underwater stumps, logs and rocks help create the perfect environment for bass, crappie, catfish and pan fish. A state fishing license is required, and rules of the NC Wildlife Resources Commission must be obeyed. Heritage Day Every year, Jordan Lake holds a fall festival that celebrates the unique cultural and natural resources of this particular region. 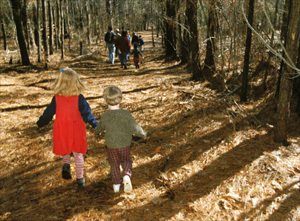 Hiking Crosswinds Campground offers a one-mile trail for campers only. The trail is easy and on fairly level ground. At Ebenezer Church, two trails that are each less than a mile long offer a better look into a reservoir environment. A .25-mile trail in Parkers Creek, another trail in Poplar Point and Seaforth"s 1.4-mile trail also exhibit the lake environment. The longest trail in the recreation area is a three-mile loop at Vista Point. Picnicking Ebenezer Church, Parkers Creek, Seaforth and Vista Point offer picturesque spots for picnicking. Grills and trash containers are provided, and drinking water is located nearby. Each area has a picnic shelter. The shelters can be reserved for a fee. Otherwise, they are available on a first-come, first-served basis. Contact the park office for reservations. Swimming Sandy beaches are offered at Ebenezer Church, Seaforth and Parkers Creek. Swimming is permitted in designated areas only. 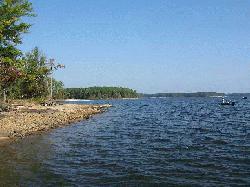 The Parkers Creek beach is located on the lake"s subimpoundment; boats launched on the main lake do not have access. 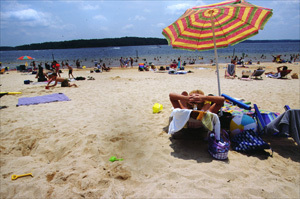 Crosswinds Campground, Poplar Point and Vista Point offer sandy swim beaches for use by campers only. Closely supervise children at all times and outfit them with personal flotation devices when they are in or near water.